A few posts back, we discussed running on a treadmill as a metaphor for achievement and success. And I spoke about the little game I play during my workouts at the gym, seeing how many people I can outlast on the treadmill. Recently during one of my treadmill sessions, a question popped in my head — Who am I really racing? If you talk to anyone who's completed a marathon, they'll tell you it's just as much a mental challenge as a physical one. Some might even tell you that the mental challenge is far and away greater than the physical. So really the only person I'm racing is MYSELF. The barriers to achievement and success don't come from anything external but rather from the battles I wage with myself. 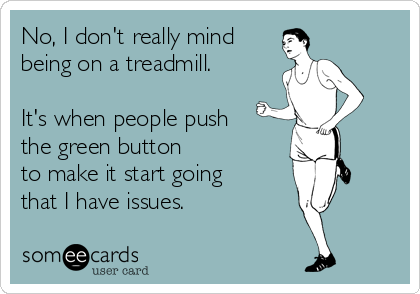 In the treadmill game, it's not a matter of who stays on longer than me. It's a matter of do I really want to keep going? And the same goes for anything you're trying to achieve because anything worth doing will have it's own unique set of challenges. And the true obstacle is whether or not you're willing to face those challenges. Scary? Yea, I guess it is a little. All that responsibility — our achievement, our success, OUR LIVES — all rest in our own hands. But isn't that kind of awesome? Isn't it empowering? Like Jim Rohn always said, "It's not the blowing of the wind that determines your destination. It's the set of the sail." To me that means WE control the outcome. To me that means WE win every time. So, who are you racing?